"Doug, is that your field credential, or are you just happy to see me?" On the eve of the Philadelphia Eagles' first preseason game against the Pittsburgh Steelers, let's go ahead an update our 53-man roster projections. I don't expect Foles to be traded this offseason, as a "Teddy Bridgewater situation" isn't likely to strike twice. With Sudfeld being groomed for long-term Wentz backup duties, the Eagles will roll with three quarterbacks in 2018. Adams has shown at least something as a runner, and was clearly better than both Pumphrey and Smallwood in pass protection. If I'm Howie Roseman and/or Doug Pederson, I know what I have in Pumphrey and Smallwood, and it isn't much. Adams has at least been intriguing enough for me to think that he's worth developing, whereas the other two have not capitalized on their ample opportunities. Of course, the preseason games will be great tests for this group of backs. 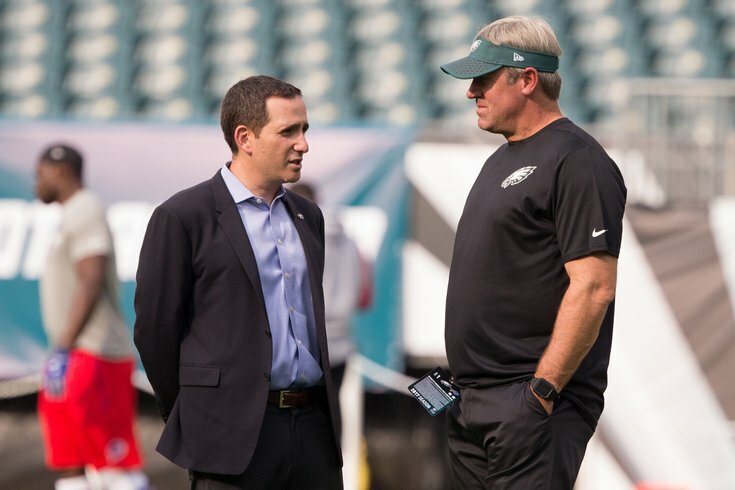 Jeffery, Wallace, Agholor, and Hollins are all locks, while Gibson feels like a good bet to stick based on the ceiling the team believes that he has. Beyond them, there are good arguments for Greg Ward and Rashard Davis as long-term prospects, but my sense is that the Eagles should be able to retain them on the practice squad, while Wheaton is more of a polished receiver who can potentially help immediately should a receiver or two go down. Ertz and Goedert are locks, and Rodgers remains pretty close to a lock. The other tight ends in camp have had a few moments, but they're too few and far between. Although Billy Brown has come on a bit of late, nobody has done enough to warrant a spot as a fourth tight end over the players at the other positional groups. The starting five plus Vaitai are all obviously locks, and Pryor is rapidly becoming one. Seumalo still makes a lot of sense as a trade possibility, in my view, unless the team views him as the primary backup at center, as opposed to moving Wisniewski to the middle and re-shuffling the line in the event of a Kelce injury. Previously, I noted that Chance Warmack hasn't had a good camp, but figured he'd survive on the premise that he's a Jeff Stoutland favorite. However, he's been really bad. Based on what he has done to this point in camp, his roster spot as a guard-only backup simply isn't justifiable. Mailata is now a week deep into his first NFL training camp, and he acknowledges his body is “crook” – Australian for "ailing." His arms are feeling it the most; now that the pads are on and the intensity turned up, he’s using them really for the first time to battle pass-rushers, and it's taking a toll. A team physical found that he has a Grade 2 PCL tear in his right knee from his rugby days, so he wears a large brace around his massive leg daily to protect from further injury. On the ball of his left foot, there’s a nasty blister the size of a silver dollar from the thousands of kick-steps he has been practicing. Hello, redshirt season on IR. Last time around, we noted that Graham, Cox, Ngata, Barnett, Long, and Bennett are all going to make the team. You can go ahead and add Vaeao to that list, and he may even start over Ngata. Sweat is also a near-certainty to make the team, though it's possible the team could try to "redshirt IR" him. We'll bet against that for now. With Graham's status uncertain for Week 1, we'll project Means to make the roster for the third straight season. And finally, I'll reluctantly keep Qualls due to a lack of depth at defensive tackle. If you'll notice, there's no Nigel Bradham listed above. Because he's suspended for Week 1 of the regular season, the Eagles can keep 53 players, and Bradham will go to the Reserve/Suspended list concurrent with final cuts, so the Eagles won't lose a player unnecessarily that they would otherwise keep. The Eagles will also have to consider how much they value Nelson, a free agent acquisition who counts toward the Eagles' compensatory pick formula this year. I'll spare you the long, boring explanation on this (and only a small percentage of you will have any clue what the rest of this sentence means), but if Nelson were to be released at 53-man cutdowns, he would not count toward the formula and the Eagles would likely gain an extra compensatory pick. I'd rather have the pick, if I'm Howie Roseman. The Eagles could still trade a cornerback before the start of the season, whether that be Darby or one of the younger players. If by the time they get to 53-man cutdowns and they still haven't yet traded a corner, I think the Eagles will keep the above seven roster-worthy players, on the premise that they would still have a week to work out a deal for one, without leaving themselves thin, post-trade. If a deal isn't worked out by Week 1, maybe you can sneak Killings back onto the practice squad when Bradham returns. Cameron Johnston has really struggled in camp, and I don't think the team can trust him to be their punter this season. In my view, it's more likely that they'll wait for 53-man cutdowns to pick up a punter released by another team, or, you know, Donnie J'owns is still out there. So there's your punter menu. Yes, I have serious problems. But also, again, Donnie is just sitting there. So maybe just sign him.